MPF-offload operations such as this highlight the U.S. capabilities to effectively deliver mission essential gear, regardless of location; beach, port or open water. The USNS Sgt. William R. Button, a roll-on/roll-off container ship, arrived at the port of Klaipeda to discharge the equipment for the exercise. Port operations to retrieve the gear from the Button were conducted by Marines from Combat Logistics Regiment 4 and Combat Logistics Battalions 23 and 453. Working together, the Marines were able to facilitate the movement of more than 300 pieces of gear from ship to shore. This time sensitive movement of equipment was crucial to the success of the exercise. The downloaded pieces of gear ranged from artillery, tanks, and light armored vehicles, to heavy equipment vehicles and motor transport assets. The primary purpose of the MPF program is to enable the rapid deployment and engagement of a Marine Air-Ground Task Force (MAGTF) anywhere in the world in support of U.S. operations. 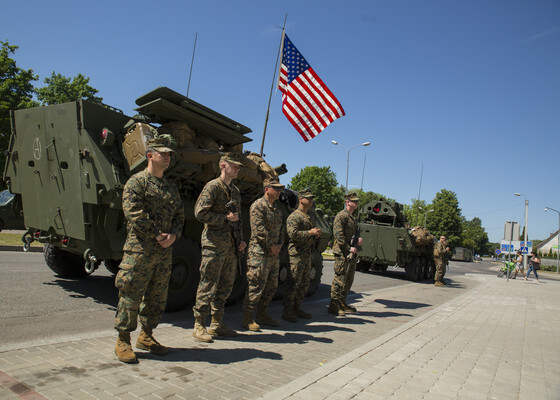 The MPF offload was an integral part of the Saber Strike, but also to the Marine Corps’ mission as an expeditionary fighting force for the U.S. Exercising the loading operations like this helps prepare Marines for any real-life disaster relief or wartime scenario.